Electricity: A group of three students becomes the battery that runs a clock, while other students light a neon lamp just by scuffing their feet. 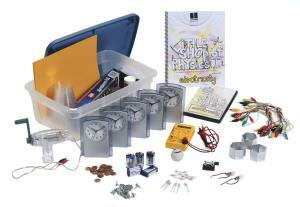 The goal is to teach the basic concepts of electricity and spark your students enthusiasm about electricity. Eight action-packed hands-on activities that will allow exploration, encourage discussion and help make the concept of electricity less abstract for your students.